rkhunter (Rootkit Hunter) is a Unix-based tool that scans for rootkits, backdoors and possible local exploits. It does this by comparing SHA-1 hashes of important files with known good ones in online database, searching for default directories (of rootkits), wrong permissions, hidden files, suspicious strings in kernel modules, and special tests for Linux and FreeBSD. 1. Log into your Dedicated/VPS Server via SSH. 6. You can test the installation by typing this command. Note: If successful, this scan will take about 2 minutes to complete. Simply replace the email address with your email. 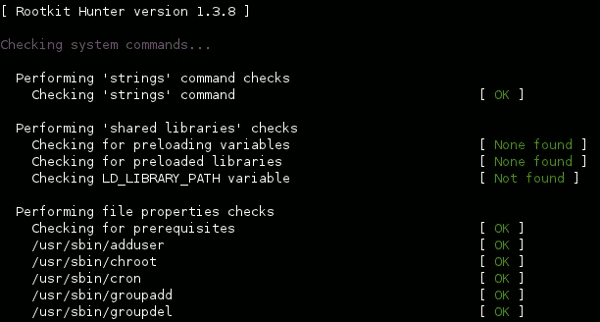 You can then create a cron job in the root tasks in Plesk or via ssh. You may want to run the update on a different cronjob maybe a weekly basis.